Moon had a girlfriend from at least 1941. She introduced him to Kim Baek-moon! Moon had a girlfriend at the Jesus Church in Myungsudae, Heukseok-dong, Seoul. (It was also called the Myungsudae Church 明水台教会.) The girl’s name was 朴雲女 Park Un-nyeo. The Japanese pronunciation is Boku Unjo パク・ウンニョ. She identified herself, and the ‘X’ is written in her own hand. The upper photo is a section of the one below. ▲ Moon is crouching in the front row, third from the left. At an interview in Seoul in the early 1990s Park Un-nyeo spoke about her time with Sun Myung Moon. She was visibly affected when she saw the photo of the February 27, 1941 graduation of herself and Moon – memories came flooding back to her. There was a feeling that something hidden was being brought out into the open. She was happy to be given a copy of the photo to take home. Then in her seventies, she lived in Seoul in poverty. One month after their 1941 graduation from the Jesus Church, Park and Moon traveled together to Japan when they both went there to study. They crossed from Busan to Japan on the same ship on March 31st, arriving in Japan the next day. Park went to study Japanese language in Tokyo – and she spoke it very well. In November 1943 Moon was matched to Choi Seon-gil. They married in 1945. 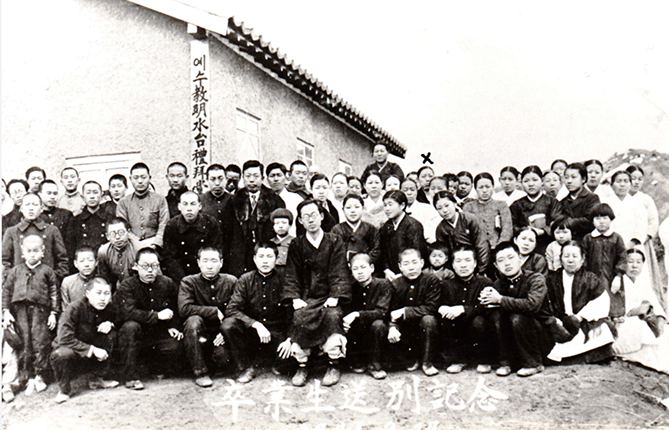 Back in Seoul, in January 1944 Moon started work for the Kashima gumi company. That October Moon was arrested in Seoul – some of his friends were communist and when they were arrested his name was found in their things. This led to Moon’s arrest. It seems that Park did not leave Japan with Moon. After her return to Korea she joined Kim Baek-moon’s messianic group in Seoul – the Israel Monastery. 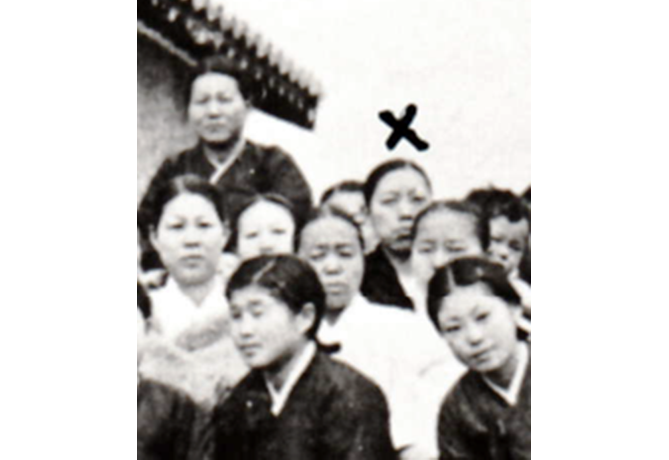 It was Park Un-nyeo who introduced Moon to Kim Baek-moon in the fall of 1945. By that time Choi Seon-gil was pregnant with Moon Sung-jin who was born on April 2, 1946. The last time Park Un-nyeo saw Moon was in 1946. ▲ Kim Baek-moon is top left. The woman on the right with him can clearly be identified as Park Un-nyeo when compared with the photo on the right. The whole picture, dated June 2, 1946 is shown below. It was taken just a few days before Kim and Moon traveled together to Pyongyang. Park seemed to look up to Kim Baek-moon as a father figure. She explained that she was expecting Kim Baek-moon to return. Park emphasized that Moon had only become interested in the idea of being a religious leader after spending time with Kim Baek-moon. 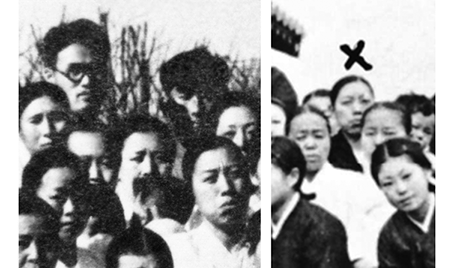 Moon saw how Kim’s followers became more devoted to him in 1946. On March 2nd that year, Kim Baek-moon had an experience with Jesus on a mountain in Gyeonggi Province. Jesus appeared for an hour between 11am and noon. This was during a worship service with 33 faithful members present. Moon was with Kim’s group until June 1946. Moon heard about Kim being called by Jesus to establish a new Israel in Korea. 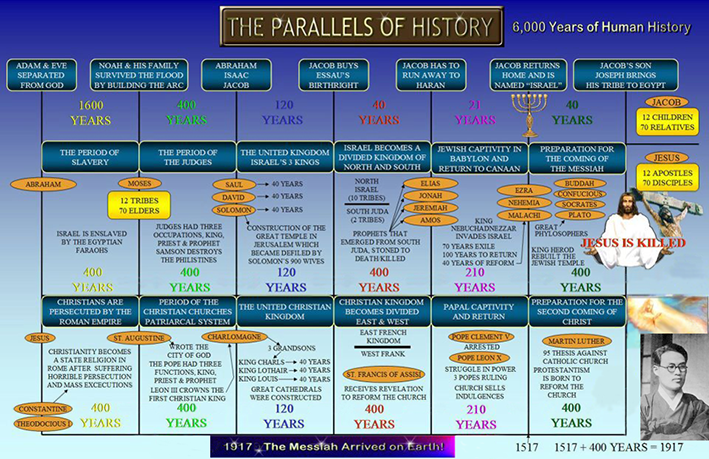 To that end, Kim began to systematize his theology and he published three books, in 1954, 1958 and 1970. 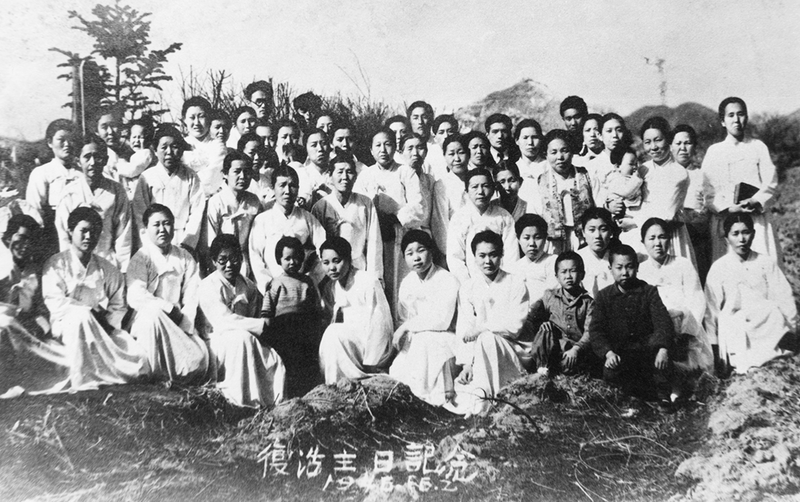 In Kim’s church, 1946 was defined as the first year of the Completed Testament Age. It is not known if Moon ever spoke about his own alleged meeting with Jesus when he was a teenager (there were no witnesses). Park Un-nyeo, Moon’s own cousins (ref. Sontag below) and Moon’s fellow High School students in Korea (ref. Yamaguchi below) certainly never heard about it from Moon. 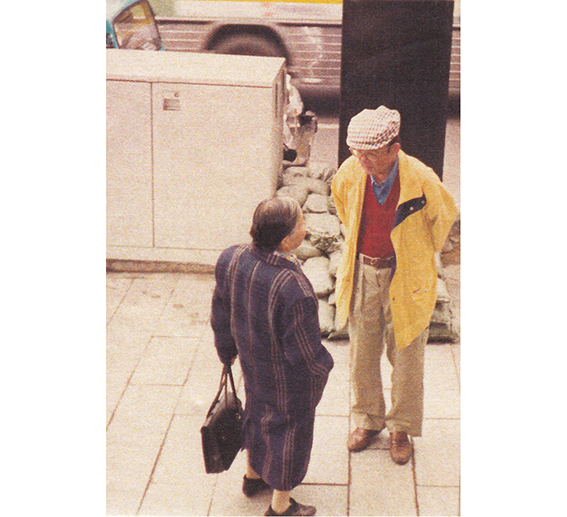 ▲ Park Un-nyeo and Eu Hyo-min were good friends – here seen together in Seoul in the 1990s. Eu was a polite man and genuinely cared about those who had been abused by Moon. Eu Hyo-min used money from his business to support various people. Eu said that Park and Moon had been lovers, and that maybe Moon had promised to marry her. Their relationship had lasted several years. It was clear that Park felt that she had been betrayed by Moon and came to hate him. Park said that Moon was very clever at manipulating women. Pak Chung-wha also said that Moon and Park Un-nyeo were lovers. Pak Chung-wha and Eu Hyo-min both also said, at different times, that Kim Baek-moon asked Moon to leave the Israel Monastery because Moon got involved in a sexual relationship with a woman in the congregation. It was not clear whether that woman was Park Un-nyeo. Does Moon give any hints about having a girlfriend? Moon: “I often had strange experiences when I went to movies. When I was a student, I took off my school uniform and put on clean clothes. School uniforms smell bad, don’t they? I used to press my hair down and keep my mouth shut. Women have written letters to me in their own blood. There was an only daughter of a famous rich man. The daughter of one of the richest families in Hwanghae Province went to school in Japan. Every month she put an envelope with money in it inside the drawer of my table when I wasn’t there. Mr Watanabe was a Japanese UC member for ten years. After he left he studied Moon’s speeches in reference to Moon’s time studying in Japan. Moon stated that he had been arrested by the Japanese police and taken to a police station at an address that he mentioned. Mr Watanabe researched that street and found that there had never been a police station at that location. There is a story that the ship that Moon was traveling on between Japan and Korea was sunk. (Michael Breen references the story in his book on page 61.) Mr Watanabe researched about the ship and found it to be also untrue. The Kwon-non Maru ferry was not sunk. Mr Watanabe did other research which has not revealed much else that is not already known. Yamaguchi Hiroshi from his book The Real Face of the Principle Movement – What is the group doing? Uncovering its creepy reality. (1975) pages 132-139. “Ryumei Emoto, who received the revelation from God at the age of 16, is supposed to have lived a very devout life during his time at the Gyeongseong Trade and Technical College. This is what is written in ‘The History of the Unification Church.’ Both Professor Doi and Professor Sonobe said, “We didn’t notice that at all.” Even though both professors were Christians and used to go to Sunday school, they have no recollection of seeing the close-cropped pupil Ryumei Emoto there. Furthermore, the former classmate who provided me with the group picture, clearly declared that Sun Myung Moon was not a religious man. The classmate said that it might have been the influence of both of the professors which affected him and made him the man we know today. Not by revelation from God himself, but because of the revelation from his teachers he became a billionaire. You can never know what life brings. Moon’s biography is not clear between 1939, when he graduated from Gyeongseong Trade and Technical College, and 1941 when he crossed over the sea to Japan. Did Moon marry his own son, Sung-jin, to his own daughter, Dong-sook – even if they did have different mothers? Did Moon really graduate from Waseda University?